Wow so much to tell. Well last Wednesday was probably the longest day of my life. I ended up flying from Detroit to Las Vegas, then Salt Lake City. I was in Las Vegas for forever (really only six hours) but it felt like that. On the flight to Salt Lake I met an LDS family. They had two children and were really nice. The father had served his mission in West Virginia and had been back for ten years. I asked for any advice he could give, he said just work as hard as you can for these two years and you won’t have to worry about the rest. I walked into my apartment in complex 14M at 11:30 at night. I surprised the rest of my district and my companion was super happy to see me. 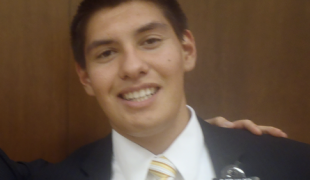 My companion is Elder Nelson from Houston, Texas. He is a really great guy, but is still pretty different from me. We have had a couple talks to get each other back on the same page. I really love the MTC. The food is pretty good and it’s all you can eat! I have never felt the Spirit so strongly before. It’s here like 24/7. Whenever I hear something really profound and awesome I get a chill down my spine. I’m averaging about two or three of those an hour. My first complete day here which was Thursday was a real wake up call. I guess I’m not as prepared for teaching as I thought… I still have a lot to learn but we practice teaching investigators several times a day. My main teachers are Sister Lyon and Brother Fuller. Sister Lyon served her mission in South Africa. I don’t remember where Brother Fuller served his mission. Every day we teach Sis. Lyon as an investigator named Nancy. She is progressing, we asked if she would get baptized, but she said she isn’t ready yet. Yesterday we met with a new investigator named Jose. He is from South America and is kind of taking lessons for “fun”. Our district is great! 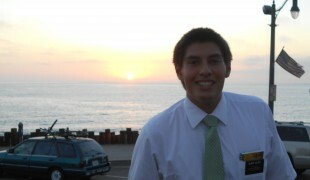 Elder Lui is Tongan from Utah. Elder Sullivan and Rawson are also from Utah. Elder Wright is from Colorado. We also have six sisters in our district. Sister Lindford and Rodriguez are from Mesa, Arizona. Sister Au Quin is from Hawaii. Sister Lee is from Utah. Sister Swizter and Stephan are from Idaho. Our Branch Presidency are really cool. President Shorter and Brother Lanely are my favorite. I was assigned as the District leader, so I’m in charge. My most important job is to get the mail. Thanks for your letters and package. I really appreciate them. On Sunday we went for a temple walk and it was really neat. Today we get to go inside. I cant wait! I leave July 10th for Los Angeles. We are flying out on Delta so if I can have some money for bags on my card that would be great. I think $100 should be fine. I took pictures but forgot to bring my camera to email them. Tell everybody hello for me and hope everything is okay.